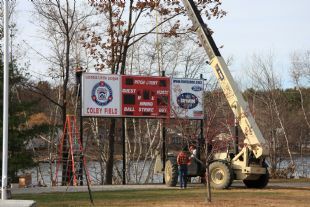 The new scoreboard has been installed on it's perch on the poles at Colby Field on Wednesday November 11, 2009 at 1:00pm. and, last but not least, our President, Mary Nyhan, for attending the installation and leading our project into becoming reality! The scoreboard will be officially dedicated on our Opening Day in April 2010. See more pictures of the new scoreboard installation under Picture Page, then LLL pictures, then scoreboard folder.